Not only have we renovated the website. We've totally renovated the restaurant. From the beautiful new bar, to the walls to the floors to the bathrooms, it's winterized, warm, cozy, and better than ever! And we offer great food and drink specials at the best Happy Hour in Brooklyn! 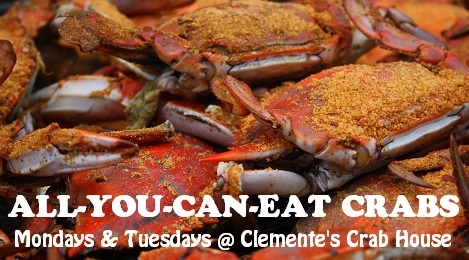 Whether it's our Internet Juke Box, featuring thousands of songs, our house DJ, or our renowned Karaoke Night, you will always be able to drift away at Clemente's Maryland Crab House. It's not just great food! It's an event! We offer catering services, and are available for private parties. Call us at 718-646-7373. We offer daily specials. Please call us anytime to check on them. We also offer large sized lobsters, up to 10 pounds. Please be sure to pre-order at least two days in advance, so we can have this special menu item prepared for you upon arrival. Call us at 718-646-7373. ALL-YOU-CAN-EAT CRABS! EVERY MON. & TUES.
RESERVATIONS HIGHLY RECOMMENDED. CALL 718-646-7373. Welcome to Clemente's! Since 2002, we have been offering a complete dining experience. Our menu offers something for everyone. We serve only the freshest products, and everything is cooked to order. If it's just a casual drink that you're looking for, then our bayside Tiki Bar and outdoor lounge is the just the place to kick back, and enjoy the picturesque Venice Marina. Clemente's dining room can accommodate all private party sizes, so bring your family and friends, and let our friendly staff spoil you.